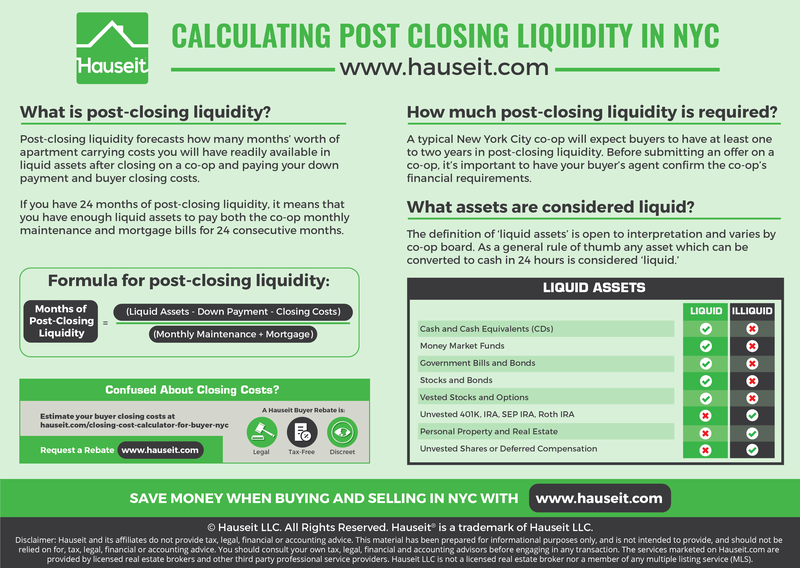 What is Post-Closing Liquidity in NYC? How Is It Calculated for Co-ops? 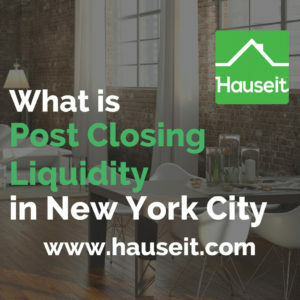 What is the definition of post-closing liquidity and why does it matter in NYC? If you are buying a co-op apartment in NYC, post-closing liquidity is one of the co-op financial requirements which the board will review as part of the co-op board application process. What is the formula for post-closing liquidity in NYC? What is the typical post-closing liquidity rule for co-ops in NYC? What qualifies as liquid assets when calculating post-closing liquidity? Post-closing liquidity is the amount of liquid funds a buyer will have once the down payment and buyer closing costs are paid at closing. Post-closing (post close) liquidity forecasts how many months’ worth of apartment carrying costs you will have readily available in liquid assets after you close on your apartment. Post-closing liquidity in NYC is typically quoted in months or years. For example, if a buyer has 24 months of post-closing liquidity it means that he or she has enough liquid assets to pay the monthly co-op maintenance and mortgage bills for 24 consecutive months. It’s important to note that the definition of ‘liquid assets’ varies by co-op. While some buildings may allow a buyer to include vested 401K or IRA assets, other buildings will only allow cash or cash equivalents to be counted towards post-closing liquidity. The definition of post-closing liquidity can be obtained by reviewing the co-op purchase application instructions or asking the managing agent. The minimum total net liquid assets (Excluding for example funds in tax qualified accounts such as 401(k) accounts) available after purchase of the apartment must equal at least 2.5 times the annual apartment carrying charges (Co-op maintenance, assessments, if any, and any apartment loan payment). Pro Tip: It’s important to include any monthly co-op assessments when computing post-closing liquidity. Even though assessments are temporary increases in maintenance, most co-op boards will want to know that a buyer can absorb the assessment expense while still passing the building’s post-closing liquidity requirements. A typical New York City co-op will expect buyers to have at least one to two years in post-closing liquidity. Before submitting an offer on a co-op, it’s important to have your buyer’s agent confirm the co-op’s financial requirements. Pro Tip: Not all listing agents are made the same. Despite what they may say, some listing agents may actually have no idea what the building’s official policies are on post-closing liquidity and the definition of liquid assets. To avoid being misled by a listing agent, it’s always a good idea to have your buyer’s agent confirm the requirements directly with the managing agent before submitting an offer. More Questions? 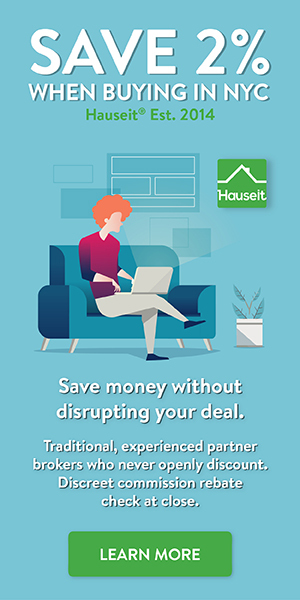 Ask us anything in Hauseit’s Forum, where New York real estate professionals come together to discuss real estate. How Much Money Do I Need to Buy an Apartment in NYC? Just read this entire article. Very informative and helpful for someone just starting out with the co op purchase process. My buyer’s agent couldn’t explain for the life of him what the definition of post closing liquidity is, and supposedly he’s a co op pro. So funny. Thank you for sharing this online with the rest of us.